520 bridge ramp in the Arboretum. At a press conference in the Graham Visitors Center on January 24, the Washington State Department of Transportation (WSDOT) and the Arboretum and Botanical Garden Committee (ABGC), which oversees capital projects at Washington Park Arboretum, announced that they had signed a historic agreement ensuring the implementation of key projects in the Arboretum’s Master Plan as required mitigation for the effects of the upcoming replacement of the SR 520 Bridge. Under the terms of the new agreement, WSDOT will pay Seattle Parks and Recreation $7.81 million by the end of February to cover the costs of a first round of mitigation projects in the Arboretum, tied to the construction of the north span of new bridge through the Arboretum, which will begin as early as summer 2014. These projects include the design and construction of a 1-mile multi-use trail, as well as improvements to Azalea Way Pond, parts of Arboretum Creek, and Foster Island. The agreement also creates a contractual framework for a final phase of mitigation that will take place in the Arboretum once WSDOT secures funding for the construction of the south span of the 520 through the Arboretum—and the new bridge is finally completed. 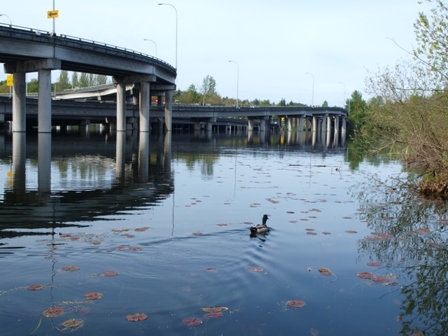 These projects include the transfer of the WSDOT Peninsula to the Arboretum, shoreline restoration in the wetlands, the creation of a new north entry to the Arboretum, and the day-lighting of Arboretum Creek. Some of anticipated effects of the new 520 bridge within the Arboretum include the conversion of a half-acre of land in the Arboretum from recreation use to transportation use, and increased shading resulting from a wider bridge structure. However, construction of the new bridge will also bring direct improvements to the Arboretum, independent of the planned mitigation projects. Most notably, during the construction of the north span of the bridge, the Arboretum’s “ramps to nowhere,” remnants of the abandoned R.H. Thompson Expressway, will be removed. Noise from the new bridge spans will also be reduced using technologies such as quieter pavement. Read the full press release about the agreement here.